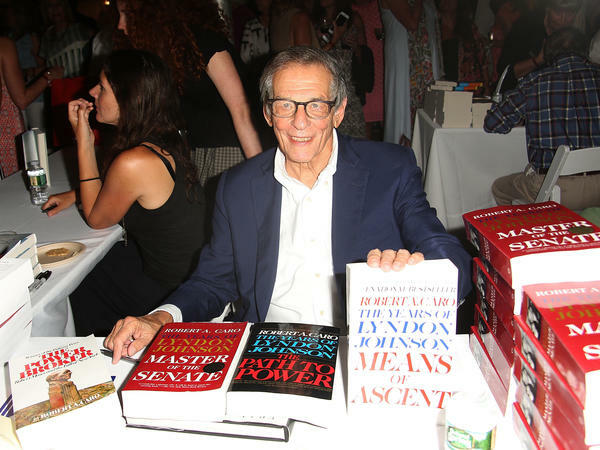 Robert Caro attends Author's Night 2017 to benefit the East Hampton Library on Aug. 12, 2017 in East Hampton, New York. Conan O'Brien once memorably described Robert Caro's sweeping series of biographies about Lyndon Baines Johnson as Harry Potter for adults. But perhaps the better comparison is the nonfiction version of George R.R. Martin's A Song of Ice And Fire. Both series are epic narratives that tell the tale of political power grabs, court intrigue, and the surprising ways that petty jealousies and other personal feelings can influence the course of nations. Anyone who read about King Joffrey's reign in Martin's novels would nod appreciatively at Caro's often-repeated maxim that power doesn't necessarily corrupt, but that "power always reveals." But let's not mince words. The main parallel between The Years of Lyndon Johnson and A Song of Ice And Fire is this: Fans get sucked into the story and then wait impatiently for years — decades! — for the next installment of the series to be written and published. Martin has repeatedly enraged his fans by writing sidebar projects instead of the long-awaited next novel. At first glance, Caro's new book, Working, could open him up to the same type of barrages that Martin has regularly invited. It is, after all, not the final installment covering the bulk of LBJ's White House years. But that would be the wrong response. Working is an inspiring — and reading it as a journalist, honestly sometimes shame-inducing — window into the seemingly superhuman reporting, researching, writing, patience, and above all, will-power that have powered his reinvention of the political biography and history genre. First in The Power Broker — his biography of New York's Robert Moses — and then in his four LBJ books, Caro has explained, in painstaking and memorable detail, exactly how two men have gone about accumulating political power, and then used that power to reshape both New York and the entire country for generations to come. Even if he or she isn't planning on spending decades turning over every single detail of a subject's life, a reporter, author, or researcher will come away from this book armed with several new approaches to fact-finding and writing. Determined to write in a more thoughtful way when he began working on books, Caro came up with a scheme to slow himself down: "I resolved to write my first drafts in longhand, slowest of the various means of committing thoughts to paper, before I started doing later drafts on the typewriter." As most other writers have shifted from PCs to laptops to tablets and smartphones, Caro has stuck with his Smith-Corona Electra 210. "Ina [Caro's wife and research collaborator] and I got a map of Florida, and for each city or town north of Miami that had 'Beach' in its name, we got the names of all its mobile home courts. We divided up the names and started calling each court to see if a Whiteside was staying there. It was a court in Highland Beach, Florida, that said, yes there was." He, of course, got on the next flight to Florida, drove to Highland Beach, and knocked on Vernon Whiteside's door. "While I am aware that there is no Truth," Caro writes, "there are Facts, objective facts. Discernible and verifiable. And the more facts you accumulate, the closer you come to whatever truth there is. And finding facts — through reading documents or through interviewing and re-interviewing — can't be rushed; it takes time." Do you see what I mean about how this book both inspires and shames reporters and writers? Robert Caro's chapters are unique. Often appearing to veer wildly off the course of his books' primary topics, they function as mini-biographies of well-known political figures like New York Governor Al Smith or House Speaker Sam Rayburn; or, just as often, primers on characters lost to history like longtime Johnson Senate aide Bobby Baker. After spending several hundred pages with them, the reader comes to know and love or loathe them, appreciate their place in history, and understand why the story about Robert Moses or Lyndon Johnson wouldn't be complete without these details about the main subjects' peers and rivals. Every Caro superfan has his or her favorites. Working weaves through Caro's career and provides the backstory of some of his best chapters. He writes about going door to door in a Bronx neighborhood devastated by one of Robert Moses' highways. After moving to Texas, he learned how women in the Hill Country struggled to pump water, do laundry, cook, and take care of every other basic household task in the years before a young Johnson convinced the federal government to electrify his rural district. But reading all this left me worried about the fate of that final book dealing with most of Johnson's presidency. Not because Caro is 83 — "I can do that math" he defensively writes at one point in Working — but because of his admitted need to track down every single fact, and answer every single question before he finishes a book. It's that "something in my nature," he writes: "After I had gotten every question answered, to suddenly think, despite myself, of new questions that, in the instant of thinking of them, I felt must be answered for my book to complete." Over and over again, he recounts how finding that one last person, unearthing that one last document, would shed some light on the path of a highway, or something about Johnson's college years. "Every time an elderly man or woman, or an impoverished man or woman of any age, gets a doctor's bill or a hospital bill and sees that it's been paid by Medicare of Medicaid, that's political power. Every time a black man or woman is able to walk into a voting booth in the South because of Lyndon Johnson's Voting Rights Act, that's political power. And so, unfortunately, is a young man — 58,000 young American men — dying a needless death in Vietnam. That's political power." I assume, decades into his dealings with Johnson, that Caro has solved the riddle of where to start. But based on everything he writes in Working, the more important question is where to finish. "I have to accept the fact that in deciding to research and write that chapter," Caro notes, looking back on the iconic Power Broker chapter about how one mile of the Cross-Bronx Expressway ruined a neighborhood and so many lives, "there was really no choice involved; that I really didn't have one." If Caro had to go back — and back and back and back — to answer every question in his mind about one mile of roadway, how will he ever be satisfied enough to step away from the legal pad and the typewriter on a book about Civil Rights and the Great Society and Vietnam and Martin Luther King Jr. and Bobby Kennedy and everything else? After all, as Caro concedes in this memoir, "of course there was more. If you ask the right questions, there always is. That's the problem."